Books - Andria Corso & Co.Andria Corso & Co.
#2 Hot New Release on Amazon! Are you tired of struggling, striving, and feeling unfulfilled? Are you ready to stop making decisions based on fear of failure, loss, rejection, judgment, or uncertainty? Is it time for you to step into the flow of your own authentic Divine rhythm of life? Take your first step by reading this heartwarming and honest book by Andria Corso. 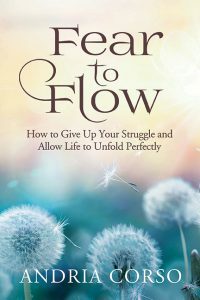 Andria tells her personal story of how loss and grief pushed her from living life based on false fears to living in the natural Divine flow of life. If, when, and how you might be living your life based on false fears. How to move through and manage these fears as well as other difficult emotions such as loss, grief, anger, and frustration. The four steps to living life from your authentic Divine flow, which results in a life of: Freedom, Love, Openness, and Wonder. In 2009, as Andria was leaving the Corporate world, she began a research project to help other Human Resources Professionals gain more credibility and respect. Having spent most of her career in a variety of Human Resource leadership roles, she felt strongly that there were things both business leaders and HR leaders needed to learn more about to support organizations having “best-in-class” Human Resource departments.